Hired Hands Homecare is a local, family owned and operated company. We take great care of the people in our communities, and we provide outstanding jobs in the senior care profession within these same communities. We earn the kudos we receive – they’re not fed to us from a corporate franchise office on the other side of the country. 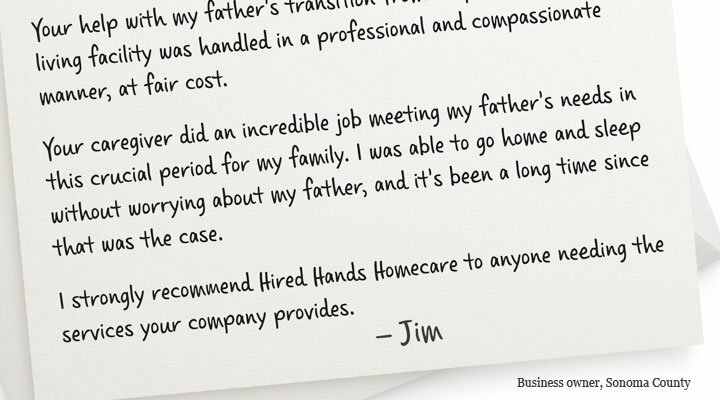 Real letters and testimonials like these affirm our dedication to providing the finest independent home care in our industry. Always, our commitment is to be your partner and safety net. I just wanted to throw out a huge thank you for doing such a great job with Mr. S. I spoke with Mrs. S yesterday and she said “Where have you been hiding these ladies? They were nothing short of perfect, wonderful in every way. Don loved them and enjoyed his time with them! I couldn’t have asked for more!” To get feedback like this is such a gift and we so appreciate your hard work and dedication. Whenever either of you are working with one of our clients, I know they are in the best hands! Mrs. S has gone through bad experiences with caregivers from other agencies and is always reluctant to go away. I could hear in her voice that she has a new confidence in her. You did such a great job that the family wants to go on another trip in September! She doesn’t have dates yet, but when we have them we will let you know and hopefully it will work into your busy lives! That was very sweet, thank you! It was a genuine pleasure working with Mr. S., he is an amazing person with a great personality and I felt very comfortable working in their home. Mrs. S. keeps the living spaces very clean, ergonomic and easy to work in, all necessary supplies were very well stocked and they have established a good daily routine that is both efficient and easy to follow to maintain a very high quality of life for Mr. S. If the opportunity arises to work with them again, I would be more than happy to accept the assignment if my schedule allows. Thank you for letting me be instrumental in giving them a positive caregiver experience. I have been meaning to let you and your company know about how well everything has been working out with Nilda and my Mother so far. I am constantly receiving great feedback from my Mom about Nilda. They get along well, and Nilda has an uncanny ability to know exactly what needs to get done. This has been especially helpful because for the first time this weekend, my Mom commented that one of the rooms is actually functional. It had been a problem since she moved into her apartment, and caused much anxiety and stress. We owe this great development of having my Mom feel comfortable directly to Nilda. Thank you for making the Perfect Match! Thank you for taking such good care of our mom – Magdalena G. M. Mom was so grateful for her personal Caregivers, the special and loving attention and patience they gave her – even when she was not feeling well. They added more fun and laughter on her good days. Towards the end, when mom was not as strong, or could not speak much, they were so tender with her, knew she communicated with her eyes and touch, and they responded back the same way. I firmly believe you have earthly angels working for you in wonderful people as Melanie, Blanca, Bay, Evelyn, Rachel, Veronica, Rosanna, Daisy, Gloria, Jackie and Donna. We will never be able to say enough words to thank you for all the care and love you gave our mom. Just know you always have our respect and admiration for all that you do to help people. All Hired Hands people are earthly angels to us, and we will always remember and be indebted to you. Shirley L. and Larry M.
Initially, Mom needed more of a companion/caregiver. Hired Hands Homecare was recommended to us by our physician here in Sonoma Valley. 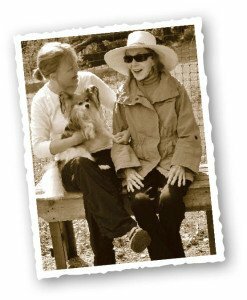 We interviewed with a Hired Hands caseworker and were asked dozens of interesting questions to determine our needs and what kind of caregiver would be the best fit for my mom. I have nothing but the highest praise for how Hired Hands handled this delicate process. It was not long, really a short time, before they found the perfect match for my mom…more than one! Your caregivers’ honesty, helpfulness, courtesy, warmth, and ability to see what is needed in advance is special. We are very impressed by the professionalism of your company and caregivers. I called Hired Hands to help my family take care of our father in Hospice Care at home. I could not have called a more capable organization. From my very first phone conversation I received compassion. That compassion was a constant with every staff member at Hired Hands; a written log was updated w/ every shift change as communication is key. Our family came to know each caregiver. They were angels. Our favorite caregiver Joseph gave as much to each family member as he did to Dad, and was intuitive to each family members emotional needs….always building our confidence. This is a company who truly cares and gave much more than the support our family was looking for. I genuinely enjoyed the post-op experience. I wasn’t really looking forward to spending the night with a stranger after surgery. Samantha set me at ease right away and soon I felt that we were old friends. She was very knowledgeable about the after-effects of surgery and very attentive. Great service! We have been working with Hired Hands for the past 3 months and they have proven to be very valuable to our overall operations at Merrill Gardens. They have been valuable because they have helped us retain residents who would have otherwise had to move to a higher level of care. A lot of companies provide home care; I have found Hired Hands to be the best I have worked with, and from the first have been impressed with their professionalism and caring hearts. They offer pricing flexibility and do a very good job communicating with resident, loved ones and our staff. Thank you for coordinating such wonderful care for my aunt. I don’t know how we would have gotten through her final weeks of life without you. The skill, compassion and thoroughness your caregivers demonstrated was truly remarkable. Thank you for the competence and flexibility of your organization, and the can-do attitude – I am happy to recommend Hired Hands as a 5-Star organization. Contact Our Petaluma Home Care Experts! Want to learn more about Hired Hands and our Petaluma home care services? Contact us today and find out how we can help your family.